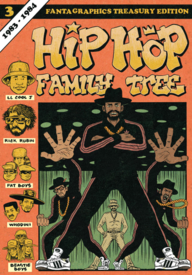 The third volume of Hip Hop Family Tree has arrived! Ed P has stepped up his game to keep it in line with the improved fortunes of the rappers and hip hoppers whose lives and careers he is chroincling here, in page after massive, Treasury Edition sized page of full color comics rendered in what might, in another era, have been referred to as "The Mighty Marvel Manner!" Here, in our present day, we will instead say that these pages are suffused with the dynamism that is rooted in the comics of Jack Kirby and those who followed in his wake. And this dynamism is exactly what is called for in describing and depicting the titanic tales of the Golden Age of Hip Hop that unfold here.